So you want to have a crafty wedding? Taking on the entire task of making and planning everything yourself can often be too much to bear. Instead, why not pick just a few things to make for your special day? Favors are a great place to start: they're simple and can be adapted to suit your tastes and colors. These sewn favor bags are perfect for filling with any kind of candy or sweet you desire. I filled mine with my favorite handmade candies from Papa Bubble. Aren't those little hearts just adorable? If you are making cookies or little cakes simply make the bag a bit bigger. 1. 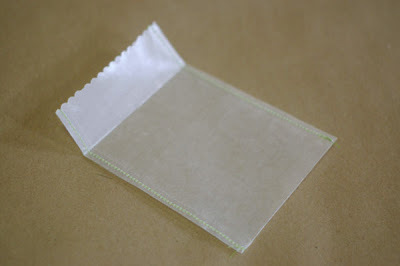 Fold your piece of wax paper in half to make a 4" x 6" rectangle. Fold the top down 1 1/2". 2. 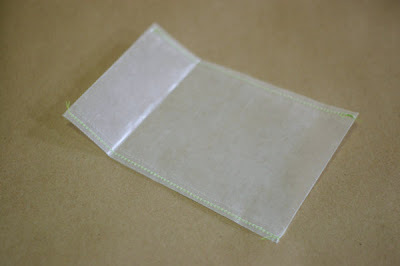 Sew down both long sides of the folded wax paper, backstitching at the beginning and end. Trim the threads. 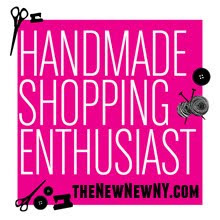 Tip: Use a leather sewing needle to sew through paper and make sure to change the needle before you go back to sewing fabric. 3. 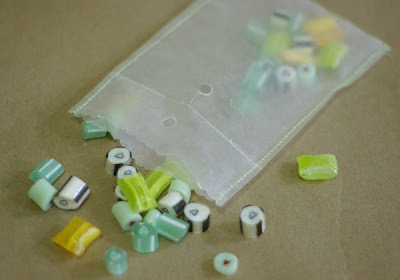 Use the scalloped edge scissors to trim the top part of the wax paper bag. 4. 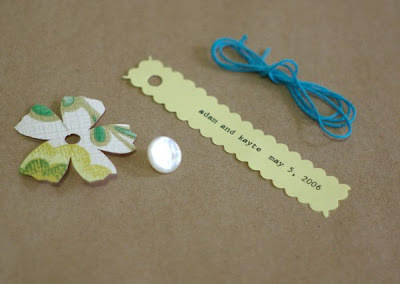 Cut a simple flower shape out of the decorative paper and punch a hole in the center. Type, write or print out your message on cardstock, punch a hole in one end and trim with scalloped edge scissors. Also, gather your button and string. 5. With the top of the bag folded over, punch a hole through the top of the bag in the center. Fill the bag with candy or other sweets. 6. Insert one end of the string through the hole from the back of the bag. 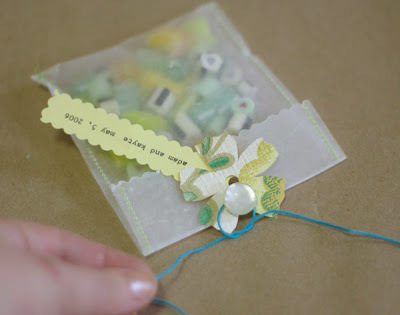 String the written tag on first, then the flower and finally the button. Bring the other end of the string over the top of the bag, wrap around the back of the button and tie in a knot behind the button to hide it. Trim the string. And there you have it! 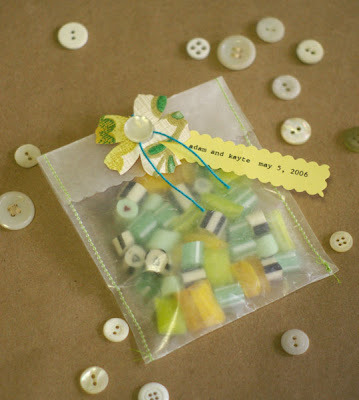 Simple and sweet favor bags for your special day! I love this idea! Super cute and fun! I absolutely love these! Such a simple, versatile and all-occasion design. Very sweet! This is really beautiful. Thanks for sharing! Those are so cute! I might use this idea instead of cello bags for some of the smaller items in my store. Thanks for the idea! So cute! You should bring these to the Housing Works event! Well done post, with beautiful pictures and color choices! Excellent idea and execution!